Al-Falaah College is honoured to be ranked amongst the leading academic institutions in the country. Our students enjoy a number of opportunities to benchmark their academic achievements. Regionally: The school participates in Olympiads, Conquesta, Toastmasters, Spelling and Speech contests, Science Expos. 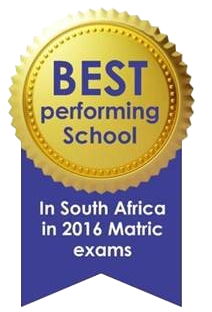 Our students continue to perform exceptionally and over the years have developed a reputation of excellence. Nationally: The National Senior Certificate Examinations is the measure for the schools in South Africa. Through the Grace of the Almighty, AFC has, since inception achieved a 100% pass rate and in the past 5 years achieved 100% Bachelor pass rate. This history of academic achievement was crowned in 2016 with AFC being nominated the Top School in the country. Internationally: Annually our students from Gr6 to 12 participate in the Icas exam in English and Maths. This Icas is administered by the University of New South Wales in Australia and is written by 1.2 million students globally. Once again we have achieved gold medals and certificates of excellence placing a few students amongst the top 1% in the world. To support this pillar of High Academic Standards we have a team of professional qualified and experienced teachers who are passionate about education. Spirituality and Character development form the basis of the Islamic Studies curriculum. Added to the classroom teaching our department of qualified Ulema and Qurra also organize Tarbiyyah and Fun programmes allowing our youth to learn outside the classroom. A structured Hifz class for both boys and girls is the pinnacle achievement for any student at AFC. The hifz classes are monitored and assessed by Madressa Tarteel Al Quraan (Qari Ismail Abdul Aziz). Arabic language teaching is being refined and redesigned to create a bias towards understanding the message of the Quran. The development of the spirituality takes further precedence daily in the mornings with a collective Quranic recitation at separate venues for Boys and Girls. The daily Zuhr prayers and the Jumuah salaah also offers an ideal opportunity for students to develop their spirituality in the company of our Ulema and teachers. Hifz students, both boys and girls participate in the many Quranic recitation competitions regionally and nationally and Alhamdullilah are consistently rated amongst the top achievers. Outreach: Students are encouraged to participate in community service and earn badges for the number of hours they have served. Within the school, each morning a group of students are given the opportunity to prepare sandwiches for a disadvantaged school in our neighbourhood. Local and global projects are adopted to make students aware of how fortunate they are in relation to other children and families. The Interact Club of the school drives the passion to help communities. Sport: A comprehensive sports programme supported by well-maintained facilities and coached by experts in the field creates the ideal opportunity for participation and physical development. Students develop and hone their skills under the guidance of coaches who are passionate about nurturing the talent. Participation and achievement by both boys and girls in athletics, swimming, soccer, cricket, archery, volleyball and karate has been most commendable. The out-sourcing of our Sports Programme to experts has developed a significant passion for the sporting codes. Co-Curricular: Students are granted the lifetime opportunities to participate in Toastmasters, Dale Carnegie, Speech and Dram. Many of these activities are underpinned by our vision to develop leaders. Our teachers are developed and trained to assist students when they err or make mistakes of poor judgement. The discipline is administered via a structured code of conduct within which students are made aware of their responsibilities via verses from the Quran and the life of our Prophet Muhammad (SAW). Students who display poor behaviour will earn demerits whilst those who show traits of good habits are honoured with merit points. The process is transparent and is focussed on behavioural change rather than being punitive.